As all drummers know, once a cymbal has started showing signs of split damage, there's little that can be done to save them. Dream Cymbals' new initiative means that customers can cash in smashed cymbals for credit towards Dream products. Take unlimited numbers of old split, smashed or cracked cast cymbals from any manufacturer to your local Dream recycling point and receive credit towards a shiny new Dream cymbal. The collected cymbals will be melted down and reformed into an annual limited edition series. The new Forge Reserve Line is entirely made up from dead cymbals. 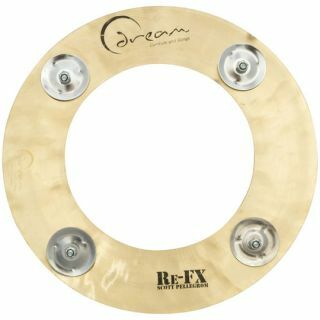 Coinciding with the UK launch of their recycling programme, Dream have also introduced the new Re-FX series; new designs built from recycled cymbals collected from all over the world. The first item in this line up is the Scott Pellegrom Crop Circle.